(Nanowerk Spotlight) The promise of revolutionary bottom-up nanotechnology is based on a vision of molecular assembly technologies where nanoscale materials and structures self-assemble to microscale structures and finally to macroscopic devices and products. We are a long way from realizing this vision but researchers are busily laying the foundation for the things to come. Assembling nanoscopic components into macroscopic materials has been an appealing goal but one of the enormous difficulties lies in bridging approximately six orders of magnitude that separate the nanoscale from the macroscopic world. New research at Northwestern University in the U.S. helps to overcomes this difficulty by dividing the assembly process into two manageable sub-steps. 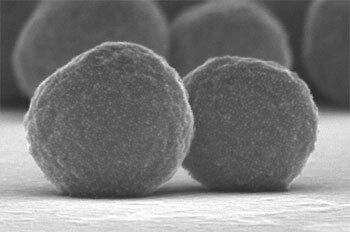 First, nanoparticles are assembled into larger, 100 nm-size, spherical building blocks, which are both deformable and "sticky" towards one another. Once assembled, these components "glue" together like pieces of clay to give millimeter or even centimeter-sized structures. The novelty of this technique is both the hierarchical assembly approach (i.e., atoms to nanoparticles to supraspheres to macroscopic materials) and the resulting "soft" structures, which contrast with previously reported hard and brittle nanoparticles assemblies/crystals. This research takes a further step in making nanoscale discoveries relevant to our everyday - macroscopic - world. "We have developed a technique to make macromaterials from nanoscale objects based on self-assembly of plastic nanostructures, which we call supraspheres" Rafal Klajn explains to Nanowerk. "Supraspheres are size-uniform, spherical assemblies of metal nanoparticles, in which the nanoparticles are connected by long and flexible alkyl chains. We found that this flexibility of alkyl chains translates into plastic properties of the supraspheres at the nanoscale. 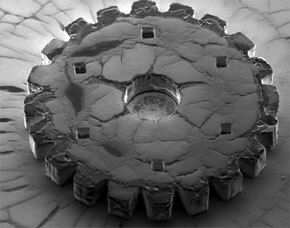 Thus, these “metal” supraspheres behave like little pieces of clay that can easily be “glued” together into larger structures." Klajn, a member of the Grzybowski Research Group at the Department of Chemical and Biological Engineering at Northwestern University, is first author of a recent paper on these findings in Science ("Plastic and Moldable Metals by Self-Assembly of Sticky Nanoparticle Aggregates"). Irrespective of their sizes, the supraspheres were highly deformable upon contact with other spheres (or surfaces) and – despite being composed in ∼92% weight by weight of metal – had the mechanical properties of a plastic solid. It was this plasticity and "stickiness" of the supraspheres that enabled their further assembly into macroscopic materials. 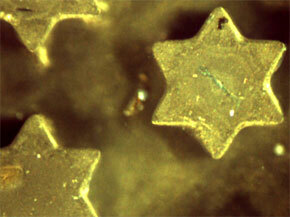 A macroscopic sample of this metal material has a consistency of wax and can readily be molded into arbitrary shapes. At the same time, it is electrically conductive – the researchers call it "metal wax", or "moldable metal". This combination of plastic properties and electrical conductivity is quite unusual and might potentially complement conductive organic polymers in flexible electronics. "We have also found that the suprasphere materials undergo a structural evolution upon gentle heating at approx. 50°C" says Klajn. "During this process, organic surfactants coating metal nanoparticles desorb to leave behind a monolith of a pure metal. These metals have a porous structure and due to their high surface areas, they are potentially interesting for catalysis." Noble metals are known to catalyze a number of important chemical transformations, e.g., palladium- catalyzed Suzuki reaction, gold-catalyzed CO oxidation. "With our straightforward route to porous metals in bulk quantities, catalysis is an obvious application for our new materials" says Klajn. "Importantly, our metals are nanostructured, which is known to improve catalytic performance. In addition, our method is also applicable to mixtures of different metal nanoparticles. Here, the final products are bimetallic (or trimetallic, etc.) structures, in which the two catalytic materials are 'mixed' at the nanoscale. Such bimetallic materials could be used to catalyze more than one reaction at once. In addition, we can readily control pore size in our materials, which is of potential importance for separation science." This research by the scientists at Northwestern shows how new materials can be constructed in a hierarchical manner starting from nanoscale components. Furthermore, by modifying the underlying components they show how one can control the resulting macroscopic structure/material – in other words, this design strategy connects the nanoscale and macroscale in a controlled manner. "We are currently developing 'dynamic' analogues of our sticky supraspheres – ones that build themselves from single nanoparticles and fall apart depending on external stimuli, such as light" says Prof. Bartosz A. Grzybowski. "In the future, we hope to use these dynamic nanoscopic building blocks to assemble macroscopic materials whose mechanical, optical and electrical properties will be affected by light in a reversible manner."